I know that I said I wasn't going to be blogging until Friday, but I just couldn't help myself. Today I'm bringing you an extra special post on the newest Bellabox. It's so great to get a "high end" product in our boxes. I'm sure a huge majority of subscribers have never used Bobbi Brown before because it's expensive and not easily available, so this was a great inclusion. I like that it's a sample, as I've been flooded with mascaras from Beauty Boxes and magazine GWP's that I have around 11 unused mascaras! I'm really excited to try this. They had a full size lipstick in their first box and I missed out as I started getting boxes from box 2. My colour is "Showgirl" which is a fuchsia colour. While the lipstick is super cute, it isn't really practical. It would be IMPOSSIBLE to find if it fell into the bottom of your bag. This is from Sabastian's Strengthening and Repairing range. There is a sample of a shampoo, conditioner and mask. I really love getting masks in the boxes as it can be so difficult to find great masks. Now I'm not sure if everyone gets this or if it was just me (and "mature" skinned women), but these are anti aging. One thing that frustrates me is getting anti aging products when I'm only 27. I have raged about this when I was sent anti aging products instead of make up from Glossybox, so if you're a regular reader you'll know it's my pet hate. The box is about "Pampering yourself, pamper your mum" so this can be shared with your mum. My mum lives interstate so it can be difficult to share. While I probably won't use the moisturiser, the eye cream will be helpful. These are a serum, just housed in a capsule. It's an interesting idea. 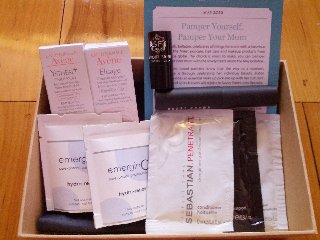 I have received a few EmerginC products from the beauty boxes but have yet to try any of them. Overall, this is very much a "sample box." Compared to LHI, who gave their subscribers 3 full size products, Bellabox had none. While we do sign up for a sample box, we have been spoilt with full sized products in the past and that can be double edged sword because you start to expect it. Now that I Love This Box is no longer, sadly we will only be getting 2 beauty boxes a month, Lust Have It and Bellabox. Now this can either mean that since there's no competition, the quality of the boxes may end up worse. Or it could mean that the quality of the samples get better due to companies being able to give more samples out. What do you think of this months box? What did you get in your box? I got the exact same items as you did, and pretty much feel the same way! I prolly wouldn't have chosen that shade of lipstick but I'm keen to try it anyway! It is really tiny though! It is soooooo miniature! Will be super easy to lose. Ohhh no. Did you contact them? BB is great with making up for it and sending out replacements. I got the same as you but my lipstick was a icky brown color lol, and I was a tad dissapointed nothing special for mothers day like they did with the valentines day box! Ohhh no. I don't know why they send out browns when bright colours are on trend. I loved this box! I am only 23 and I use anti-aging products, they even say on the card that if you really want them to be effective you have to start using them in your early 20's.It's a shame that the box's aren't always packed perfectly, but they are certainly much more even than Glossybox. I received the same items too and overall am quite satisfied. It's a sparse box but I also received the special edition mothers day box at the same time so I'm inundated with products! On beauty basket - please please don't sign up. I signed up and am yet to receive anything at all, not even a reply to my countless emails. Beauty basket appear to be nothing but a ripoff, happily taking subscriptions but never delivering a single thing. 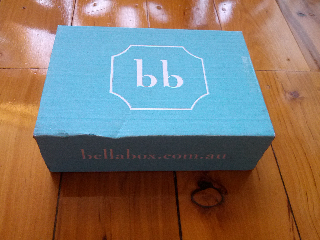 Bellabox on the other hand are GREAT! Consistently provide wonderful customer service so I am ok if they now and then deliver a somewhat lean box - they always make up for it by treating us again the next month! I got the same as you, except for a revolting brown mini lipstick. Overall, I think the quality of this box is very bad value for money. I am really disappointed in what I received this month. Ohhh I would have been disappointed if I got the brown shade. You poor thing. Yeah BB have been great with their products. With only them and LHI they will need to provide a better box or people will leave them. The capsules are cute! I think I will use them. I have 4 days worth of capsules to try out, hopefully that will give me enough time to work out if I like the product. I'd prefer a few more capsules though.. It would have been nice to get a few more, so we could try them out for a week. A couple of days doesn't really show results. Sounds a little disappointing this month, yet to receive my box, although now im a little disheartened. I was under the impression we would be getting a full size moroccan lip silk thing that they were showing off. Some people did, and others got the lipstick or a eyeshadow. Have you got your box yet? I saw your post on your blog. You box was so much better! !